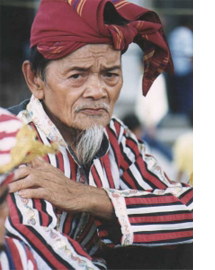 HIGAONON:One of Mindanao’s Lumad ethnic groups believed to be the first settlers of Iligan. The earliest Spanish accounts refer to Iligan(or Yligan/Elegin) as the name of the settlement found at the mouth of the river that bears the same name(also Tambacan to many people).It was this same settlement that the early Jesuits in Mindanao came upon sometime in the 1630s. Around the 18th century, Iligan referred to the large military province or corregimiento, which comprised the present-day provinces of Lanao, Misamis Occidental, Zamboanga del Norte, and portions of Misamis Oriental. When Ferdinand Blumentritt cited the earlier ethnographic accounts pointing to Subanos as the inhabitants of Iligan he must have referred to the corregimientos Misamis-Zamboanga side, concededly Subano territory till the present.